The Boston Celtics, after building a big first half lead, hung on to beat the Miami Heat 110-105 on Monday night. The game was much more difficult and stressful than it should have been after the C's led by as many at 23 points, but at this point of the season, in the race for home court advantage in the first round of the playoffs, a win is a win. Brad Stevens continued to role with the double-big starting lineup of Al Horford and Aron Baynes in the wake of some improved defensive efforts. The team rewarded this decision with a great start. Celtics two-big starting lineup off to another strong start. 10-2 lead, and the Heat are just 1 for 7 from the field. The Celtics were not only pressuring the Heat on defense, but they were getting steals/securing rebounds and pushing the ball HARD. A quick outlet and a long breakout pass had the C's off and running, and created a number of odd-man fast breaks that led to points. Boston has always had success when they push the pace, but there seemed to be an even bigger emphasis on it tonight. When the Heat threw a zone defense at the Celtics to try and slow down their offense, the C's turned up the ball movement and just dismantled Miami. The ball was swinging side-to-side without any hesitation, with Kyrie Irving and Jayson Tatum knocking down wide open threes as a result. Kyrie and Tatum combined for 17 of the teams first 32 points. Tatum looks to be feeling much better after Saturday night. He's got 11 points already. The Celtics continued to push the pace for the rest of the first quarter, and pushed the lead out as many as 20 points. Even with Jaylen Brown (back spasms) missing the game, the second unit was able to force some turnovers and follow the lead of the starters. You could tell that the team was engaged and determined early on. One of the better starts for the #Celtics this season as Boston leads 36-17 after 1Q. Tatum leading the way with 11 pts, Kyrie Irving has 6 pts and 5 rebounds. The #Heat got 4 pts from 3 different players (Adebayo, Dragic and J. Johnson). Horford was all over the place in his time on the court in the first half. The big man, who missed the game against the Nets on Saturday night, seemed refreshed and ready to make an impact. Horford had seven points, five rebounds, and five assists, including some highlight reel passes, in his first 13 minutes of action. Horford continued his all-around effort for the rest of the game, and secured his first triple-double as a member of the Celtics. The Heat were able to cut the Boston lead down to 13 points midway through the second quarter, but Kyrie quickly quelled the storm with back-to-back threes to extended the lead back out to 19 and force Heat head coach Erik Spoelstra to call a timeout. The Celtics were able to control the tempo and maintain their lead for most of the second quarter, but a late 14-5 run from the Heat cut the lead down to 14 heading into the halftime break. Boston did a great job of limiting Miami from three-point range. The Heat are a very good three-point shooting team, and are most effective when they are knocking down perimeter shots. The Celtics were able to chase the Heat off the three point line and force them into the congested paint. The well-oiled machine that was the Celtics' offense in the first half came to a screeching halt in the third quarter. Boston came out lazy and sloppy, a trend that has become far too familiar in second halves over the past few months. Goran Dragic was a catalyst for the Heat. He got a few shots to go late in the first half, and carried that over to the third with 13 points in the first five minutes. Dragic and the Heattles cut the Boston lead down to six midway through the third quarter, but a quick 8-2 Celtics' run stretched the lead back out to 12. Kyrie and Gordon Hayward hit back-to-back threes and Horford added a bucket to right the ship and steady a team that was just waiting to give this game away. With the Boston lead back to 11 heading into the fourth quarter, the Heat employed the 2-3 zone they had tried in the first half. With Kyrie, known zone buster, on the bench, the Celtics weren't able to get many quality looks, and Miami was able to take advantage of that to close the gap. 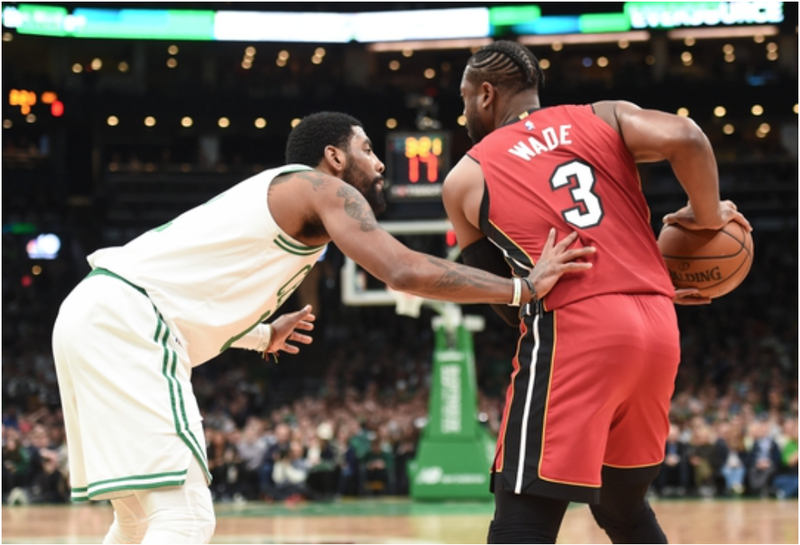 The Heat are an incredibly hard playing team, and they worked the lead all the way down to three points with less than half the fourth quarter to go, but the talent of the Celtics carried them to a much needed win. It wasn't pretty, but Boston did just enough to get the victory and keep pace with the Indiana Pacers, who beat the Pistons tonight, in the race for the four seed.